Matt Kenseth held off a charging Kyle Larson to win the AAA 400 Drive for Autism at Dover International Speedway. The Joe Gibbs Racing driver gambled on the last pit stop of the evening by taking two tires. It paid off and put him into victory lane while qualifying him for the Chase for the Sprint Cup. 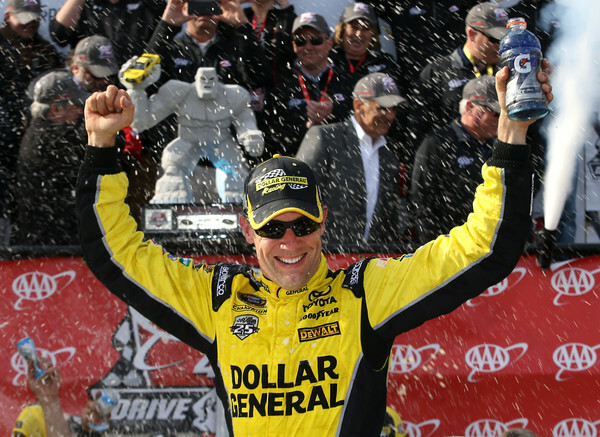 Kenseth became the seventh different winner in a chaotic second half at the Monster Mile. On lap 353, a chain reaction ensued on a restart. An 18-car pile up took place after Jimmie Johnson could not proceed because of a gear issue. The multi-car wreck, which included Kyle Busch, Joey Logano, and AJ Allmendinger, caused an 11-minute red flag. A battle for second between Kyle Larson and Carl Edwards sent Edwards spinning into the inside wall. The wall was protected by a SAFER barrier. Kenseth held off Larson as well as rookie Chase Elliott to win his third career win at the one mile track. Kenseth battled with the young stars in the remaining laps Saturday afternoon, but was able to hold his position for his 37th Sprint Cup victory. He led 48 laps in his Dollar General Toyota Camry.